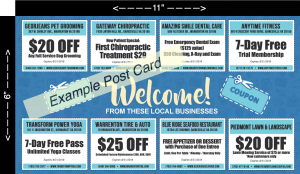 Please enter your information in the form below to reserve an exclusive featured ad / coupon offer on our next Welcome Neighbor postcard mailing to one or more of the areas listed below. No payment is required to reserve a space now. You will not be billed until we speak with you to confirm your reservation and the details of your advertised offer. Each mailing goes out to 500 high-income households in the towns listed below. The cost is $95.00 per ad spot per mailing. Discounted rates are available for purchases of more than one ad spot per mailing and/or more than one distribution area. We will contact you once we receive your information to confirm your reservation and billing information. If you do not have a website, enter n/a in this field. What special pricing, offer or discount do you want to offer new residents in your area? Examples: Buy one item or service, get another item/service free; $ ___ off purchase of (item/service); or ___ percent off purchase of (item/service). Enter the date when your coupon offer will no longer be valid. If you have any comments or questions about the Welcome to the Neighborhood postcard mailing, please add your message here.